Ed Gah a mosque in Kabul has been the true evidence of Mughal art . Id Gah Mosque is the second largest mosque in Kabul. This beautiful mosque is located in one of the porch areas of Kabul. This mosque is located near the Mahmud Khan Bridge and National Stadium. Every Friday many Muslim comes here for their Friday prayer. Every year millions of Muslims come here twice to do the id prayer. This beautiful is also considered as one of the popular and oldest mosque in the Afghanistan. This mosque has always been the attraction for Muslim pilgrims around the world. This beautiful mosque was built in 16th century by a Mughal Emperor named Babar. Later with its renovation was done by other leaders. This mosque has seen lot up of ups and downs of this beautiful city. This mosque has always been very important and even in early 1919s it was mandatory for each and every Muslim to read the prayer at mosque and those who don’t follow the command were fined. This mosque has seen the war between British government and Afghanistan; people considered that war as a holy war for their existence. Emir Habibullah’s speech in the favour of holy war against British was given here. 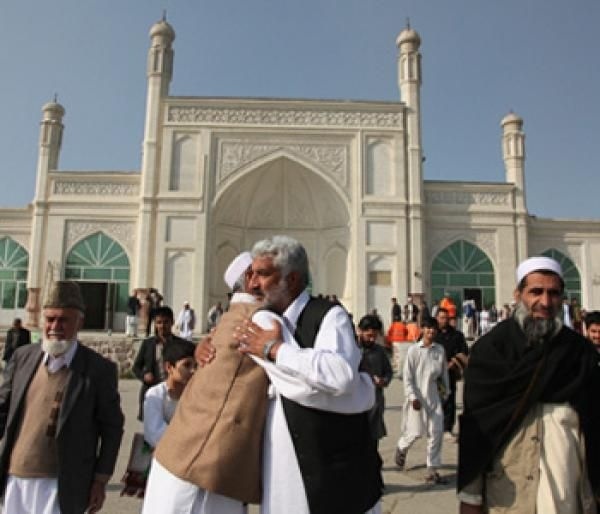 And later this mosque became the evidence of Afghanistan’s freedom. This beautiful mosque is built on very good locality of Kabul and that is why it attracts many architects. This mosque has always been the best pilgrimage spot and its ambience is so spiritual that one can feel smitten with Allah. Surrounding of this mosque is so peaceful and holy that it helps each and every pilgrim to pray and feel the presence of god. This mosque is very large in surface area. The infrastructure is so delicately done that one can see the unique art during the rule of Mughals. This mosque has four minarets, central beige and one big court yard area which is commonly known as Id Gah Square. These sculptures can be seen in most parts of Afghan..
this mosque is so beautiful.. The art form followed centuries ago were good..
Clicked during Ramadan I suppose.. This love should be spread across the world.. This is a beautiful moment.. This is a sign of brotherhood and love.. If I will get the opportunity to go, I will definitely visit this place.